Hey hey now Peanut Butter Don’t Be Jelly (Smoothie Bowl), we still love you too! No secret that we like our peanut butter, or nut butter in general, especially me and my youngest daughter A. On most days now though we are able to control out cravings a lot better than we use to. Not that peanut butter every day is wrong! 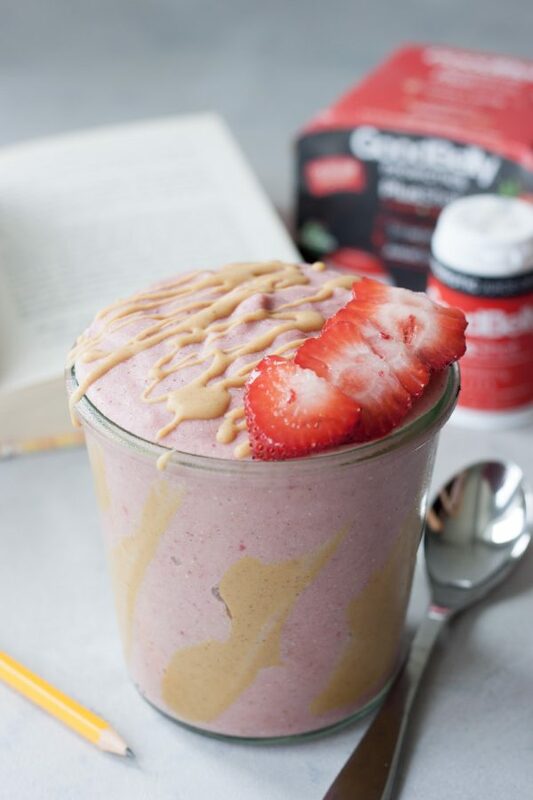 That said sorry peanut butter you aren’t the star of the show in this Peanut Butter Don’t Be Jelly Smoothie Bowl! You can’t beat a classic peanut butter and jelly, especially this year with our homemade sourdough which has changed life so much as we know it this year. Bread was never consumed as much as it has been this year. It was only fitting that this classic combo was going to be made for the girls first week back to school but was also an option I thought about entering in the GoodBelly #12DayBellyReboot Contest last week. So many smoothie bowls were made and I even remade this one a couple times with the new addition of GoodBelly. I also re-photographed it as a rain shower came the first time I photographed it and this time turned out so much better. The choice came down to the girls though and they picked the Mango Dragon Probitoic Smoothie Bowl to enter thinking it was bright, colorful, everyone would like it, versatile and a little less kid/teen focused. I tried to tell them hey peanut butter and jelly isn’t just for kids, hello I’ve had my fair share of them this summer and crave it probably as much or more than they do! Even though we entered the other one this one HAD to be shared, with or without the GoodBelly option it’s a simple delicious combo! We’ve made many “peanut butter and jelly” smoothies and smoothie bowls over the years but this simple combo is good. Almost like saying the best pb&j but the next week try another combo and nope that is the best one, or but wait… yep it’s like that there is one for every mood and each time you think you’ve had your best one there is another. Maybe because they always seem to hit the spot. While I usually just go classic I grilled a peanut butter, jelly, and banana over the campfire this summer camping and it was amazing, thought it couldn’t be beat. Then Labor Day weekend we took a bike ride to the park and decided to make a picnic lunch. We made pb&js on fresh baked homemade sourdough, brought some chips (don’t usually by them but did for our picnic), and lemon aids. We were sitting there and I had to throw chips in the middle of my pb&j just like I did as a kid and thought at that moment it was the best. Of course these are things I don’t make every day, or even every week or month but they are so good at that moment. Ok back to this smoothie as it’s a little bit healthier, just a little bit. Haha, kidding. This is one perfect for the kids first week of school (or anytime) of school and I used Ripple Dairy Free Plant-Based Milk for added protein. 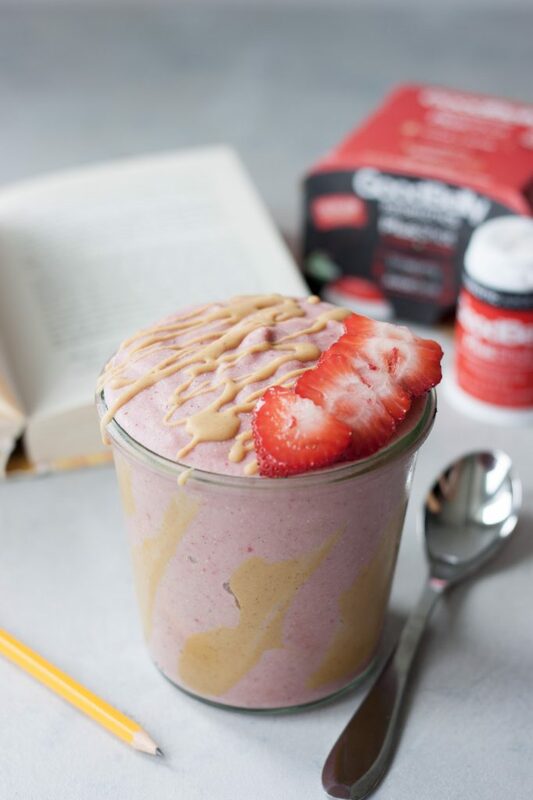 Just blend that up with strawberries and added sweetener of choice to taste if needed and you have a simple delicious protein shake that tastes like a strawberry milkshake that isn’t overly sweet. I also like to add in chia seeds for added nutrition and as S, my oldest daughter, loves them. To add those I like to soak the chia seeds in the milk for at least 5 minutes (or overnight) before blending. This adds omegas that are good brain food before school. Optional GoodBelly for probiotics and gut health. Any way you blend it it’s a delicious healthy smoothie that kids, and us kids at heart, will love! Oh Peanut Butter Don’t Be Jelly (Smoothie Bowl) we didn’t forget about you. This is important, now you can follow this or not but there is a very special way to eat this smoothie… smear the peanut butter on the inside of your bowl or jar. Then with every spoonful you can scrap it up the side and get just enough to get a perfect bite each time, plus it’s fun. Of course if you really love peanut butter you can also drizzle a little peanut butter over top too, when doing this I like to add a little coconut oil so you get a crunchy peanut butter “magic shell”. Of course the option is yours. Peanut Butter Don't Be Jelly Smoothie Bowl is a delicious healthy smoothie bowl inspired by a classic flavor combo pb&j! Plant-based, gluten free, and vegan this smoothie is packed with nutrition and is sure to be a favorite. Many optional add-ins for protein, probiotics, omegas, and more! If soaking chia seeds add those to your dairy free milk and let sit for 5 minutes, or longer (up to overnight) in the refrigerator. Prepare your bowl or glass by smearing peanut butter inside the glass, reserving 2-3 teaspoons if wanting to mix with coconut oil for drizzling. 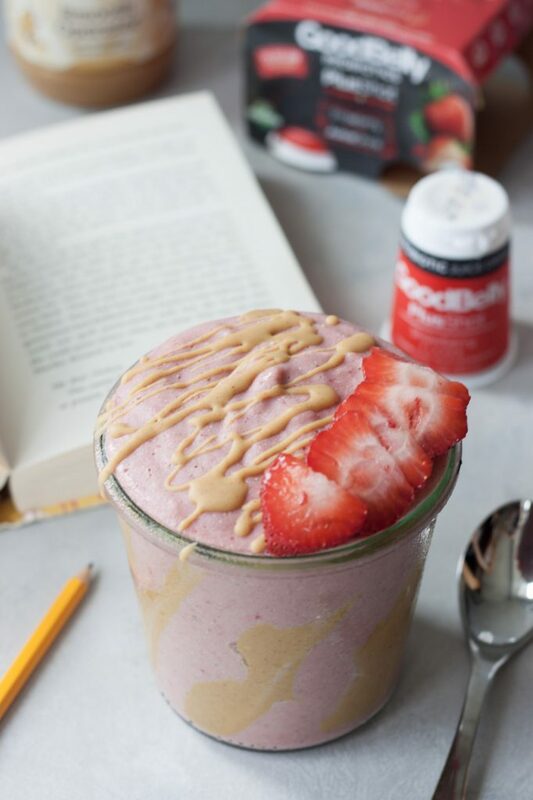 In a Vitamix, or high-speed blender, blend non dairy milk (with soaked chia seeds if using), optional probiotic shot, and frozen strawberries using tamper tool as needed until thick and smooth. Spoon into prepared bowl and top with optional peanut butter drizzle and sliced strawberry. We use plant-based protein milk in this one but you can also use another milk and add in a scoop of vanilla protein. Yes! S would tell you all about them and the best ways to enjoy them, I think she loves them more than I do! 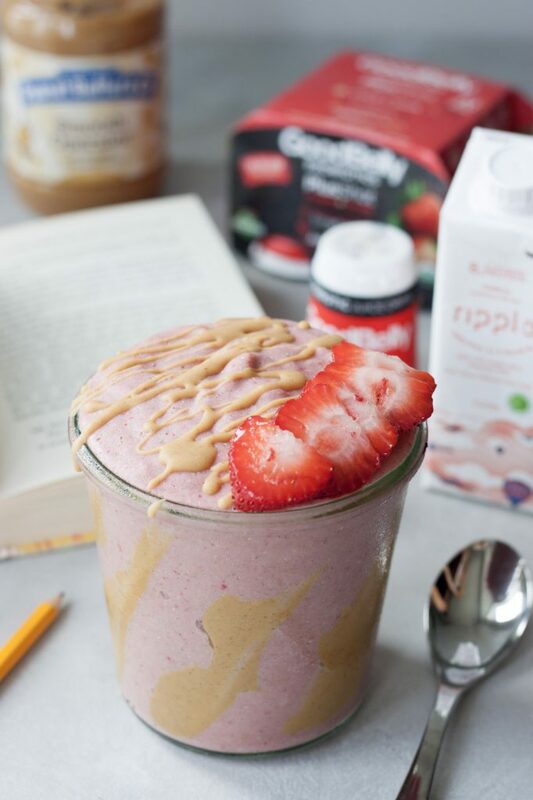 PB and J is my fave smoothie ever, can’t wait to try yours! It looks perfectly thick and creamy. DROOL. Thank you! Can’t go wrong with pb&j, it always hits the spot! Oh, I can’t help but be jelly!! This looks so tasty! Growing up I actually didn’t care for PB&J. The whole jelly thing weirded me out (I was so picky). But now I love the combo and definitely love it in smoothie form too! Interesting, I don’t think I ever knew a kid growing up that didn’t like pb&j. I knew ones that didn’t like crunchy pb, crust on their bread, or seeds in their jelly but never anyone that didn’t like them. Crazy how tastes change over the years. I love pb&j. When I was a young adult, I totally never ate pb&j. But now that I have kids I realize how amazing it really is! Funny how things change when we have kids! I am pretty jelly of this right now. 🙂 Wish I was having one for breakfast! Yes! I Love playing on the playground with my kids….no sitting on a bench checking my phone for me when we’re at the park! 🙂 Loving this PB & J smoothie! It’s fun and a great way to destress and get in some activity. Haha, love the name of this post! So great. This looks super delicious! Thank you, I loved it but SEO doesn’t. Haha. So I’m drooling over this form of peanut butter and jelly, and then you mention the sourdough. So now I need a smoothie and a sandwich! They both hit the spot, sometimes it’s hard to pick just one! Oh my goodness, this recipe looks and sounds so delicious Sarah! I think I have all of these ingredient goodies on hand, too. It’s a fun and delicious one that just hits the spot! Thank you! In the summer months it’s much easier to get smoothies and smoothie bowls in as we crave them but as things get cold here I find it harder now. Maybe years of overdoing them. Whoooa this looks good! We just started getting our twin girls into Laura Scudder’s old fashioned PB, might try to use it for this! I haven’t heard of that peanut butter I’ll have to check it out.